Digital Health is the convergence of the digital and genetics revolutions within medicine and health. The goal of digital health is to ultimately improve the quality of our healthcare and our daily lives. By adopting new technologies such as wireless sensors and fitness trackers, healthcare can become more efficient, cheaper and more accessible. Digital Health is big business and investment in 2016 has started strong with a record$1.8B in funding. According to Startup Health 2016 has already seen 4 deals over $100M, as compared to 7 in all of 2015. This trend is set to continue as industry players take an active role in piloting, investing in, and mentoring young digital-health companies helping to bring the innovations to market needed to sustain long-term health outcomes. 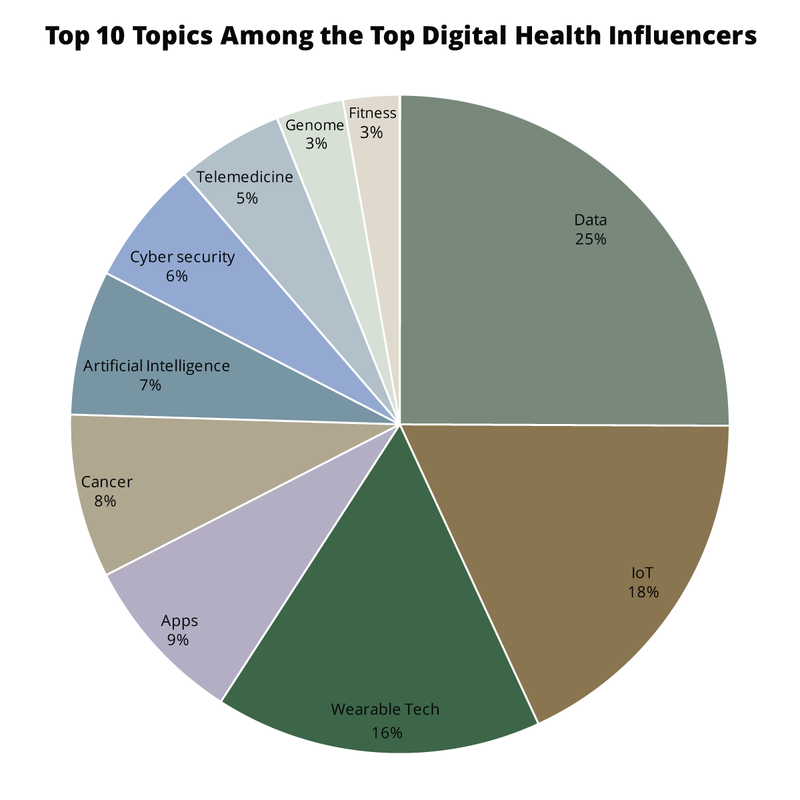 We reached out to some of the top 20 influencers to ask them for their views on Digital Health. We spoke to Dr. Bertalan Mesko (#1), Paul Sonnier (#4), Bill Bunting (#5), Maneesh Juneja (#7), Jane Sarasohn-Kahn (#15), Arshya Vahabzadeh, MD (#17) and Sherry Pagoto, PhD (#20). Be sure to follow them to stay up to date on the best content and resources on Digital Health! We were very interested in seeing which Digital Health professionals and brands were leading the online discussion, so we analysed 113K+ tweets from January 19th – April 18th 2016 mentioning the keywords: “Digital Health” OR digitalhealth. We then identified the top 100 most influential brands and individuals leading the discussion on Twitter. What we discovered was a very engaged community, with much discussion between individuals and brands. Below you can see a network map of the online conversation with the number 2 brand Rock Health at the centre. This map was created with our Influencer Relationship Management software (IRM). Be sure to click on the map to enjoy the full size network diagram in greater detail. 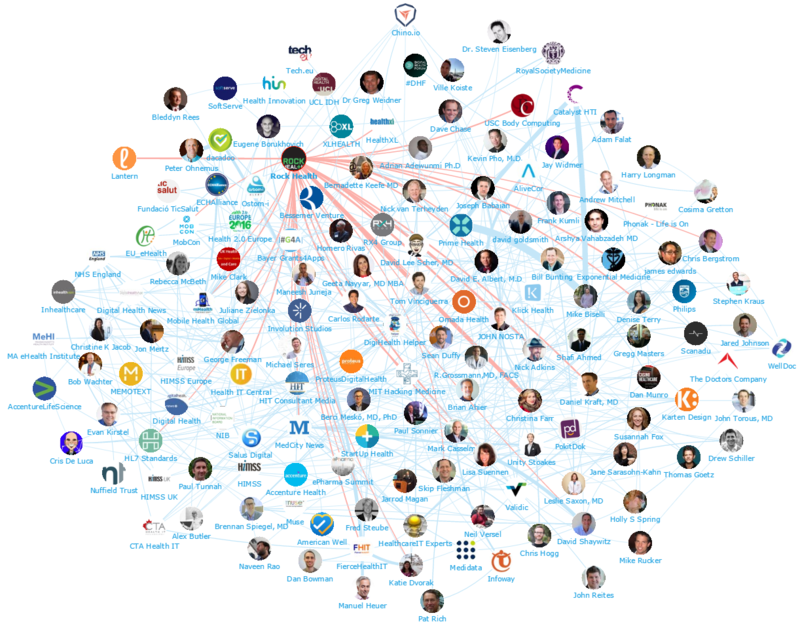 Below you can see another network map created with our Influencer Relationship Management software (IRM) showing the #2 influencer John Nosta the centre, and the conversations to and from the different influencers in his field. If you are interested in learning more about identifying, managing and engaging with influencers click here to get in touch! 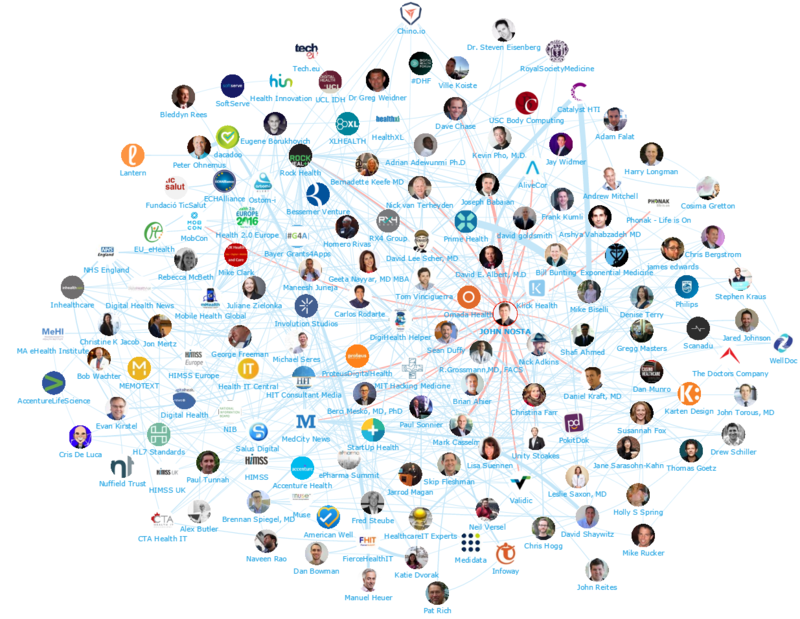 We looked at all the individuals engaging on Twitter to bring you a list of the top influencers in Digital Health. Below is the top 50, if you want to see who ranks from 50-100 be sure to download the full report by clicking the button below.